One of the first things I noticed in Myanmar was that roadside eateries were painted a dark green and had the word Myanmar in white or red written in the Roman script on this. I couldn’t read the rest of the writing because it was in the Burmese script. It took me till the evening to figure that this was the local beer: a nicely bitter lager. They have a stout which I was unable to get. There is a competitor called Dagon, whose beer I tried to taste, quite unsuccessfully. Neither could I taste the third local beer, called Andaman. It seems that Myanmar Brewery Limited, which is reported to have connections with the military, has a lion’s share of the market. There are two wineries in Myanmar. I tasted the red from Red Mountain winery. The Shiraz which you can see in the photo here was quite reasonable. The Family liked it, but it was a touch too acid to for my taste. We passed by the estate later when we were in the Shan state of Myanmar. The property is owned by a Myanmar national, and the wine is made by a French expert. 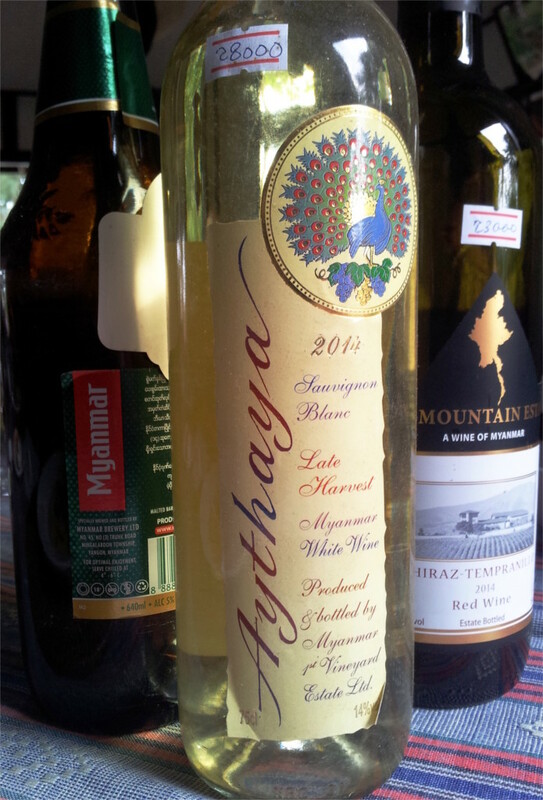 The Aythaya white is made in an estate owned by a German who also makes the wine. I saw a spätlese from Aythaya, and marked it down as something to taste later. We never saw it again! There are also foreign brands of both beers and wines available. We were served a nice Chilean wine one day. Heineken and Carlsberg are visible. Although I did not pay much attention to spirits, it was impossible to miss the recipe you see in this photo. 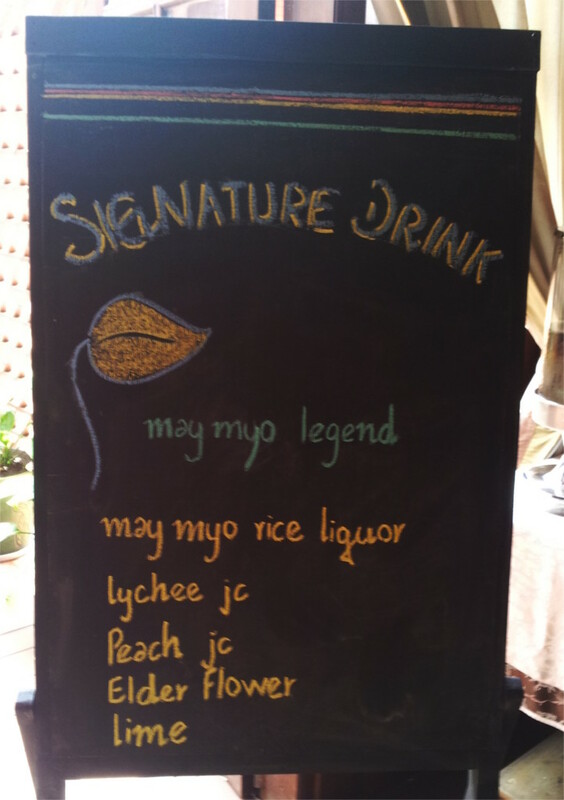 I first came across it in a restaurant in Pyin Oo Lwin, a British era hill station formerly called Maymyo. Later I found the same cocktail was served in lake Inle under a totally different name. It seems to be a tourist favourite, and therefore available everywhere that tourists go in Myanmar. The non-alcoholic drinks were also interesting. Fresh fruit juices were widely available: watermelon, pineapple and apple were the common ones. One outstanding drink was the fresh avocado juice. Avocados are grown in Pyin Oo Lwin and probably in other hilly areas, since they are widely available. The Family became a fan of the lemon iced tea. This was always house-made. The well-brewed tea and fresh lime made it much better than the canned lemon iced tea one usually gets in the rest of the world. Roadside eateries served hot drinks, usually ready-made coffee or tea with lots of condensed milk, quite different from the Indian chai. I had to overcome my aversion to sweet and milky drinks, but once I did I liked it. I always want to drink the fresh fruit juices when I travel but usually don’t since I’ve heard that you can get food poisoning that way. Have you ever had that problem? Never, but then I have it only at restaurants which look reasonable.